It is such a pleasure to be a part of designing and making your engagement ring, we consider it an honour to be part of such a special, significant part in your lives. 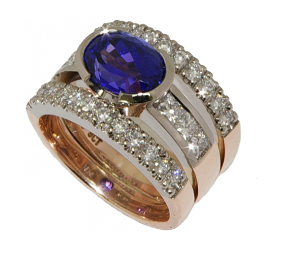 Its nice to know that with Engagement rings….there are no rules. Whether a Diamond ring, 3 stone, solitaire, sapphire, ruby, or any other gemstone, there are no formulas you need to follow in order to be wearing your dream engagement ring. It is important to know if you intend to wear a wedding ring or not, as this can change how the ring is designed, some people choose to wear just one ring in which case making the ring compatable with a wedding ring doesn’t have to be factored in. We would love to see you in-store so we can take you through the numerous images of our one off designed and handmade engagement rings.